It’s the “Gong Show” we know and love filled with a lot of senseless, crazy, goofy talent(less) acts which are followed by entertaining commentary from host and celebrity judges. The golden gong remains the same. But, how the terrible acts are exited, does not. 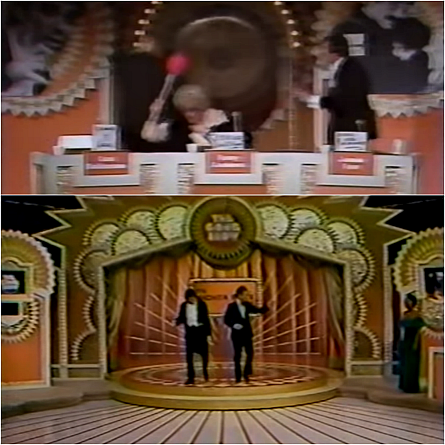 Nostalgic for the original “The Gong Show”, it’s disappointing that when an act falls below the lowest of acts which results in them getting “gonged” (the same as when an act gets three “X”s on “America’s Got Talent”) they don’t get the large hook to carry them off of the stage as done in the original. Instead, once they’re gonged, the host then lets the judges make comments. The eliminated acts are then chauffeured off of the stage by a beautiful model. No trap doors, no Gene, Gene the Dancing Machine…nothing extra that escorts the cancelled acts off stage. Once an act is axed, they don’t get to go further on the show. The acts that are not “gonged” get scored and commented on by the judges. In the premiere episode, the panel of three celebrity judges included actors Wil Arnett, Ken Jeong, and Zach Galifianakis. Taking iconic host Chuck Barris’ place is Mike Myers as British comedian Tommy Maitland. The acts that survive the Gong get scored by the judges on a scale from 0 to 10. The act with the highest score wins $8,000.17 in the form of a large check! This odd monetary amount keeps with tradition. The prize amount (according to Wikipedia) given to the winning contestant on the original ‘Gong Show was $516.32, then later $716.32. In the show’s premiere episode, there were two acts that tied. In this situation, the judges deliberated to determine the more deserving act. 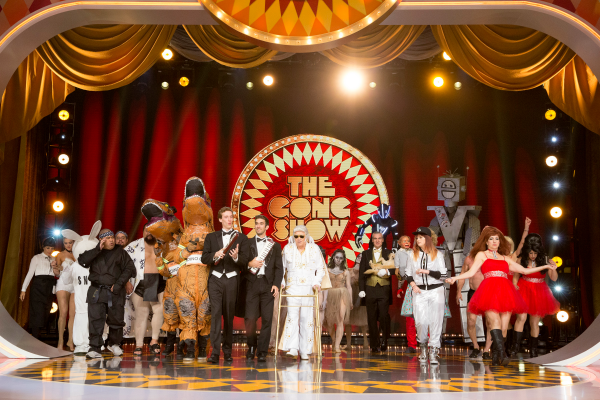 ABC boosts that they brought “The Gong Show” into the 21st Century in a press release. However, the set has kept with a 1970’s vintage theme and looks very similar to the original stage. The actual Gong also resembles the original Gong which favors a large golden doughnut. 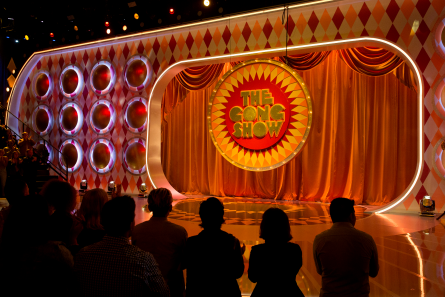 Pictured: Original “The Gong Show” stage and Gong. Although there are a slew of original acts, most of the comedy relief comes from the host Tommy, and the celebrity judges. The first act in an episode was a unicycle Yeti – basically a man dressed in a Scatchwatch suit riding a unicycle as he played flaming bagpipes. He called his act “Unipiper”. He escaped the Gong, but at the end of his act he threw a pie in his own face, paying homage to regular occurrence on the original ‘Gong Show. Other acts included a piano player playing backwards and upside down; a Mary Had a Little Lamb singer who held a pet tarantula in place of a lamb and did something with it that Ken Jeong commented was “the worse thing I’ve seen in my life.”; a couple who blew bananas into each other mouths; a mature black-belt who showcased his moves; and finally a singer who had a thing for judge Will Arnett. So far what’s missing from this updated version that made the original such a gem, are the entertaining repeat acts (yet to be seen, but we can hope for) such as “The Unknown Comic”, and “Gene, Gene the Dancing Machine”. What also made the original so special was the randomness of it all, implied chaos. Random objects would get thrown onto the stage at acts if they were awful, and if they were really terrible, they’d have pies thrown into their faces. Host Chuck Barris himself got tossed a few of those as well. Though the judges do interact with the acts, it doesn’t fit as well into the flow of this organized talent variety show. Without the entertainment of watching to see what bad acts will have done to them for being horrible (that’s why we watched), it’s just a really bad version of “America’s Got Talent” featuring the worse of the reject acts. And, nobody wants to sit through that. 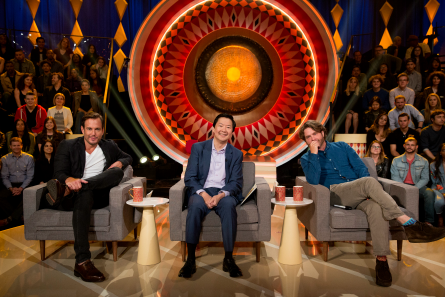 The one hour long “The Gong Show” premieres Thursday, June 22nd on ABC at 10 pm EDT.